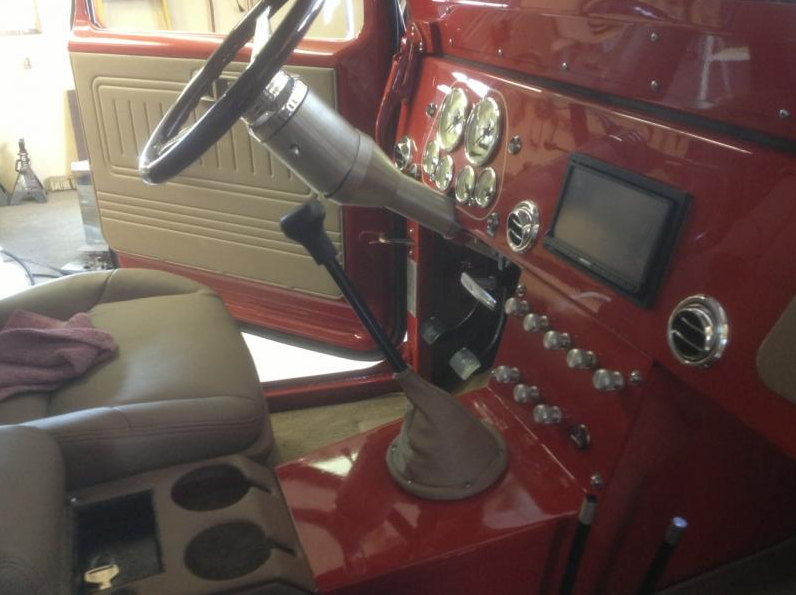 This custom crafted truck is an all aluminum FJ-45 Extra Cab!This meant another 8″ of cab space. As we all know The FJ-45′ Pick ups lack interior leg room! 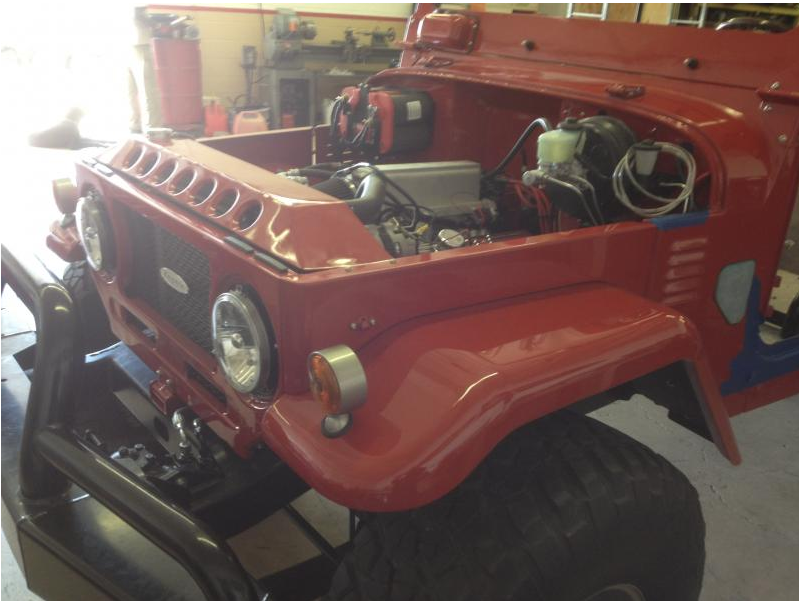 With all the modern components you can think of while keeping a Classy/Hot Rod/Classic theme, A healthy V8 engine, 5 Speed trans”NV4500″ , A/C and Navagation was installed. This truck was top shelf all the way! A custom aluminum body was crafted with the custom removable hard top. 350 H.P. V8 conversion. 5 speed transmission. Orion Transfercase. Old Man Emu (OME) 2.5″ suspension lift, Powers this hand crafted Cruiser with ease and comfort. 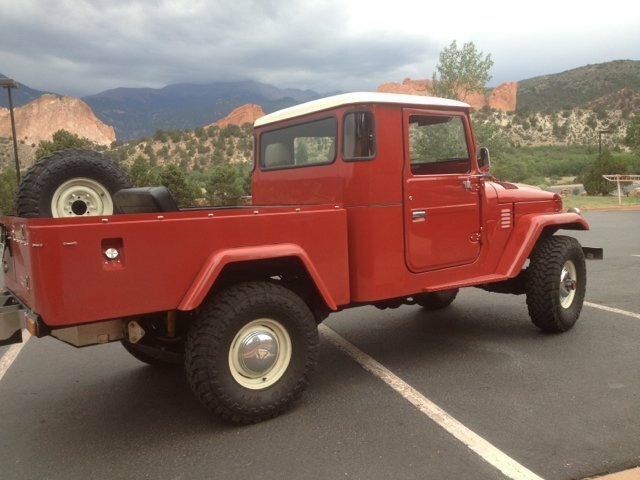 Red Line Installed ARB air lockers both front and rear, disc brakes front and rear and a large capacity fuel tank allowing this truck to handle and drive in the safest way. A Power steering conversion was also fitted . Custom leather interior with red stitching, Custom rear mounted Hurricane A/C – Heat conversion was built to keep the inner passenger floor and dash area clean. Red Line installed a Custom Kenwood nav/stereo providing tunes and modern bluetooth/ navigation. Power seats from a 2006 Toyota 4 runner provide comfort and electric adjustments while re wrapped Katskin Leather with red stitching, trims out and matches the custom tan interior. 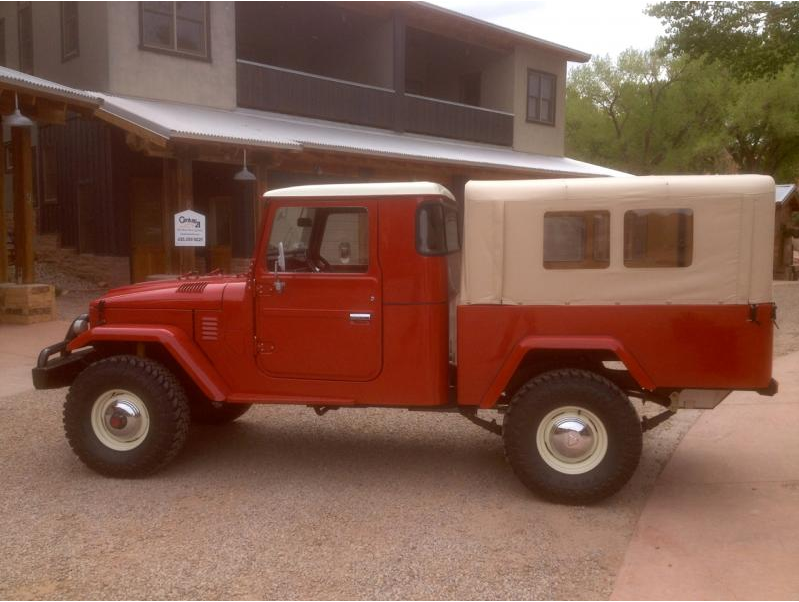 A Custom removable rear bed soft top was Crafted to mimic the early factory Toyota FJ-40 soft tops. 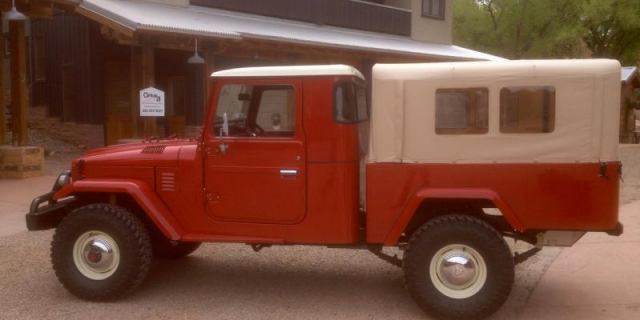 We then did the exterior paint with factory Toyota Landcruiser Red Color ” Free born” red paint. The trim color “Cygnus White” was used in contrast with the red to blend the Classy Hot Rod Retro theme. Red Line snag’d up some reproduction early Landcruiser hub caps for the Factory steel wheels. Wrapping the wheels with Toyo MT Open Country 33×10.50×15″ was a perfect choice for us to blend in the Retro feel.